Photo of Sameer Makarius taken by Miguel Greiner. Curtesy of Ian Greiner. Still from Begin, Sameer Markarius (1953). Born in Cairo, Egypt in 1923. His family moved to Germany and then to Hungary, where he graduated from school, and then studied shortly at the Gallé Academy of Arts. A non-figurative painter in the geometrical-constructivist school, active in the art scene in Budapest since 1945. participating in the first exhibition of non-figurative art ever held in that city. He was a founding member of the Hungarian Group of Concrete Art and a member of the “EuropeanSchool." In 1953 he movedto Buenos Aires. He participated in the abstract avant-gardes, active in the fifties and beginning of the sixties, he was included in the first show of the Neo-Figurative group (1961). Were some of this Biblicalworks wereexhibited. He held solo and group showsof painting, graphic work and photography in Argentina and abroad. His most outstandingphotographic work includeshis portaits of artists and series on Buenos Aires. 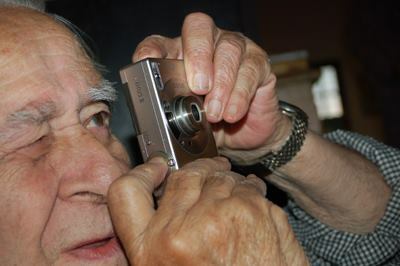 He has written many articles and essays on photography and tespecially on thehistory of photography in Argentina. He is the author of a pioneering work, “La fotografía en la Argentina, 1840-1981”, and he has published two important workson the city he loved from the day he arrived : “ Buenos Airesy su gente” 1960 and Buenos Aires mi ciudad» 1963. He died in Buenos Aires i n 2009.